Over the last few weeks we looked at some amazing homes designed with features to spoil your cat and dog, but other pets are also seeing the benefits of a home design makeover. For example, aquariums and homes for fish have always made a beautiful conversation piece at home, but these take things to the next level! This design goes way beyond any standard tank and could probably put most other modern designs to shame. 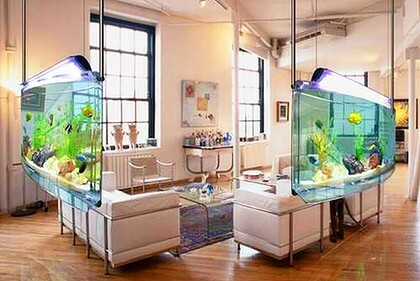 These slim-line tanks hang from the ceiling giving a full walk-around view of their scaly inhabitants. According to the distributor, Opulent Items, the fluorescent light placed on top of the frame makes the whole set-up glow, "thereby embellishing the ambience" of your home. The aquarium's filtration system is neatly concealed within the stainless steel tube frame or located many metres away in a more convenient location. It's certainly expensive - the large model is $US8500 - but for stylish fish-lovers it's an attractive option. Singer Jay-Z's former New York City residence - a $US31 million penthouse - featured some. 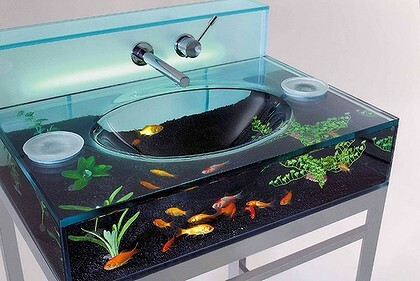 If that's a bit pricy, the Aquarium Sink is just $US4,500 although one does have to wonder if the fish become distressed when water gurgles down the plughole at the centre of their home. What's the Best Way to Train A Dog?